Kombucha tea is a fermented drink made with tea, sugar, bacteria and yeast. I have been brewing my own for almost a year now. 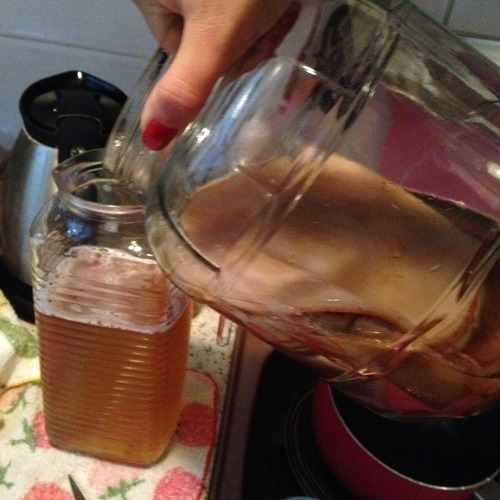 I brew black or green tea for several days with a SCOBY (Symbiotic Colony Of Bacteria and Yeast) and sugar. Some people claim that the beverage can stimulate the immune system, prevent cancer, and improve digestion and liver function. However, there’s no scientific evidence to support these health claims. Personally, I like the taste of the drink —similar to sour beer, in my opinion— and I do feel good when I regularly drink a small amount. It can seem like a complicated process, but it can quickly become routine and simple. Here is the recipe that I use to make one gallon of booch. First, clean your hands. This is a no-brainer, but your hands should be very clean – especially when handling the scoby. You can also remove your jewelry as an extra precaution. Start by heating one quart (four cups) of filtered water in a stainless steel pot until it is almost to a boil. (You will need a total of four quarts of filtered water for this recipe). 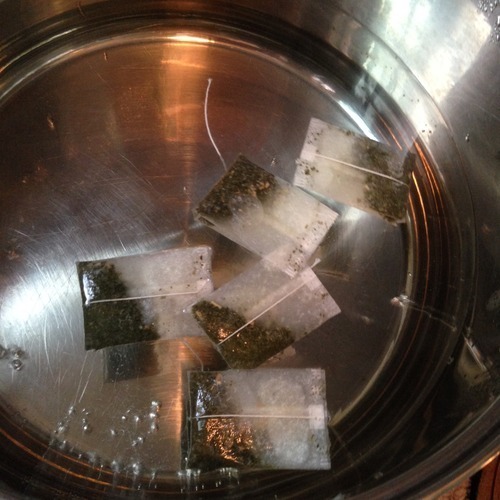 Then, add 5 or 6 tea bags or 5-6 tablespoons of loose leaf tea and steep for a few minutes. Only use real tea, such as black, green, oolong, or white. This means nothing marked “herbal,” like many Celestial Seasonings teas – it won’t work. Also, do not use Earl Grey, as the bergamot oil could hurt your scoby. Only use glassware or stainless steel when making your booch, as anything else could harm your scoby. This goes for measuring cups, utensils, and especially the glass container for brewing. 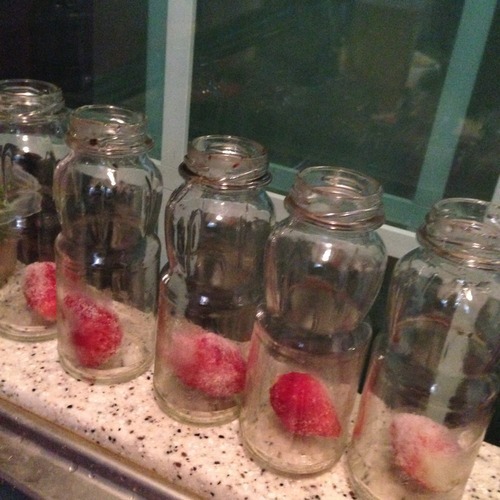 Choose a medium to large glass container for brewing your kombucha. I use around a two gallon glass container, so I can brew a gallon at a time and still have plenty of room for my growing scoby. Sterilize all of the utensils and containers that you will be using. Wash them in hot water with a natural dish soap, such as Seventh Generation. Then, boil them (make sure they are submerged) for at least five minutes and let them dry on a clean towel. As mentioned above, only use natural soap for cleaning your utensils, containers, or your hands. 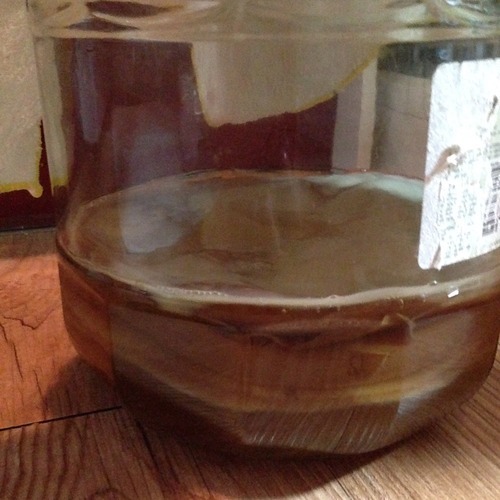 Harsh chemicals can hurt your scoby (and us and our water supply). 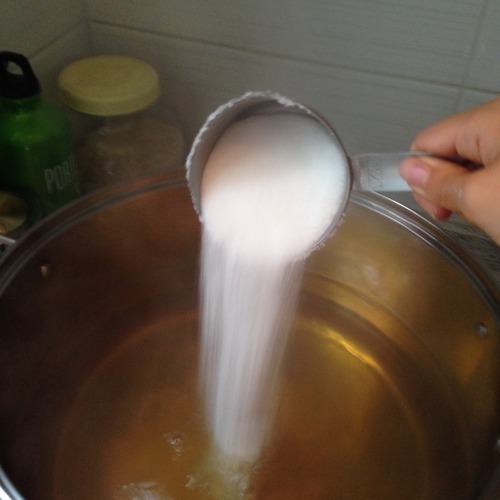 Remove the tea and stir in between 1 cup of white sugar until well dissolved. Only use white sugar when brewing your booch. Do not attempt to substitute honey or any sort of nectar. Using honey can change the chemistry of your brew, and put your brew at risk of developing botulism. For those worried about sugar content, most of it will be consumed by the yeast during the brewing process. To save yourself the trouble of sweeping up broken glass, add the remaining three quarts of water to your glass container before pouring in the quart of hot sweet tea. When you are sure that the tea is about room temperature, add your reserved cup of booch and stir well, before placing the scoby on top of the mixture, dark side down. Never pour the hot tea directly onto the scoby, as this could kill it. The scoby will probably float, but if it sinks a little, that’s fine, too. 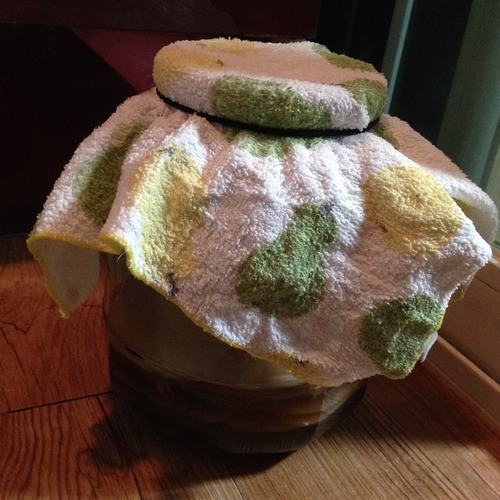 The scoby is a living thing, and therefore it needs to breathe. Secure the top of your glass container with a clean, tightly woven cloth (not cheesecloth as fruit flies will find a way in) and tight band. Cloth dinner napkins or kitchen towels work really well. Place the container in a spot away from direct light and where the temperature remains consistent. The optimum kombucha temperature is somewhere in the mid-high seventies. Lower than 70 F, and your brew could be off. Higher than 85 F and you could cook the scoby to death. Within two to three days, you should begin to see what looks like tiny white bubbles forming on the surface of your brew. Many first-time brewers mistakenly take this to be mold, and toss the batch. This is not mold, but a new “baby” scoby forming on the surface. You can keep this as a new layer on your mother, compost it, or give it to a friend. Over time, I have thrown away (composted) old layers as new ones form. The amount of time you allow your kombucha to ferment depends on your taste preference. If you prefer a more sour flavor, allow it to brew longer. For a slightly sweeter beverage, stop the fermentation sooner. For me, the magic number of fermenting days is about eight. However, in cooler temperatures it could take a few days longer. Likewise, it could take a day or two less if temperatures are rather hot. The best way to tell if your brew is close to being finished is a taste test. You can perform this by placing a clean straw in the batch and trying it out, or you can always rely on a pH strip test to assess drinkability. Expat tip: For expats living in Korea who want to try making kombucha, the ondol floor heating system will be your best friend during winter as it doubles as a consistent heating pad for your brew. If you taste your booch and find that you have over-fermented it (it tastes like nearly straight vinegar) you can add a little more sweet tea solution and let it brew another day or two. Check it until the taste is to your liking. If you do not want to salvage the batch, you can let it ferment even longer for homemade table vinegar. Congratulations, the brewing is done! Now for the next step: bottling. 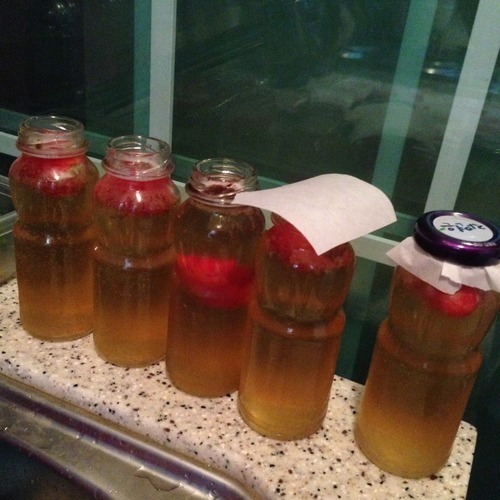 Don’t let bottling your kombucha appear intimidating or time-consuming. I can usually accomplish bottling a gallon or two of booch in a half hour, including prep time. And I assure you, it is quite simple. Gather your glass bottles. Sure you can purchase your bottles, but I prefer to reuse. Here in Korea, I like using the small glass juice bottles with reusable lids (six ounces or 180 ml), as this is my preferred amount to consume each morning. If you drink a little more booch at a time, or you want more fizziness, used Grolsch bottles with the cask lids are an excellent bottle option. If your bottles are very narrow at the mouth, consider purchasing a glass pitcher or funnel to aid in pouring. As you did before brewing, sterilize all of your bottles and utensils. Remove the scoby (with very clean hands) and a cup of kombucha and place both in another container for safe keeping. If you like, you can strain your kombucha to remove small strands of culture, bits of old scoby, and leftover tea bits. Decide what flavors, if any, that you would like to add to your booch and prepare accordingly. If you would like to flavor your kombucha, this is the time to do so! You may use dried herbs, fruit (fresh or frozen), 100% fruit juice, or a combination of the three. The possibilities truly are limitless! I suggest purchasing wax paper and cutting out squares a little bigger than the mouths of your bottles. By placing the paper in between the bottle mouths and lids, you will keep the acids in the kombucha from reacting with the lids. Place the squares of paper over your bottle mouths before capping the bottles tightly. From here, you can place the bottles in the fridge, or allow them to go through “second fermentation.” This is merely allowing your bottles to sit outside of the fridge for a couple of days (in a dark spot) to enhance the flavor and fizziness. Kombucha naturally produces carbonation while fermenting, but second fermenting allows more CO2 to accumulate in the bottles, especially if you fill to almost the tops of the bottles. You can let them second ferment for 2 to 4 days. If you want a SF time longer than 2 days, I recommend checking your bottles around every 12 hours. You may need to “burp” them to avoid any bottle explosions. Keep in mind that refrigeration does not stop fermentation, but greatly slows it; the cultures go dormant. Therefore, if you open a bottle and notice that a tiny scoby has formed on top, that is perfectly normal. You could even consume it if you wanted to! You should begin brewing another batch after you are finished bottling, so the scoby doesn’t starve and die. If you treat your scoby well, it will last for a very long time, and you even be able to share with your friends. Enjoy!